I've written more than a few of these giveaways for products covering just about every aspect of Android development, and written by dozens of authors. But this one... well, this is special, because it's a series of LiveLessons from none other than former Android Police contributor Ian Clifton. Ian's downloadable videos are called Essentials of Android Application Development. 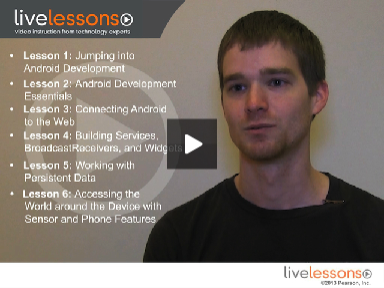 Each video equates to one lesson that helps you break down the basics of developing for Android. Most last anywhere from 50 to 90 minutes, and though they begin with some simple explanations of the basics, the last few lessons cover quite in-depth topics. And best of all? Take a look at Ian's post history and you can see that he presents things in a very accessible, easy to understand way - and you can expect the same in these videos. In just a few short years, Android has become the mainstream smartphone operating system. As Android evolves to accommodate a growing ecosystem of phones, tablets, and even TVs, understanding how to work with a variety of sensors, screen sizes, and operating system versions is vital. In this video series, Android developer Ian G. Clifton takes a tutorial-style approach to teaching the viewer how to work with all the essential parts of the Android SDK. Each lesson builds on to a single app, utilizing new features and ultimately resulting in a reference app that can be easily used to see how to implement everything from Fragments and sensors to OpenGL and RenderScript. Although built for Android 4.x, the videos cover how to target devices running earlier versions of Android by using the support library and version-specific resources in an application to ensure the widest possible audience. Thanks to informIT's awesomeness, we have 10 download codes to give away. Mind you, those are download codes for the entire series, which normally runs $120 - not too shabby. And the best part? All you need to do to enter is leave a comment below, and be sure to use a valid email address in the email field of your comment so that we can contact you should you win. The contest is open from now until Tuesday, August 14 at 11:59 PM PST. Good luck! Editorial: Are Android-Powered Cameras, Cars, Fridges, And More A Misguided View Of The Future?